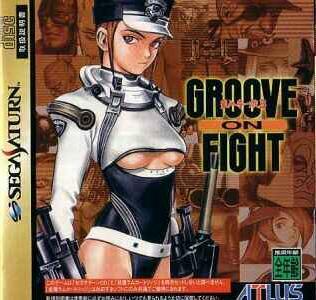 After nipping at the heels of the more popular 2D fighters, Atlus decided to reinvent the series in the third official installment, dubbed Groove on Fight. 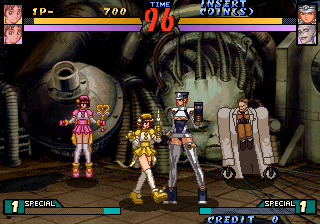 The cast of characters is almost entirely new, and the graphics have finally improved, as it now runs on the Sega ST-V system (pretty much the same hardware as the Saturn.) 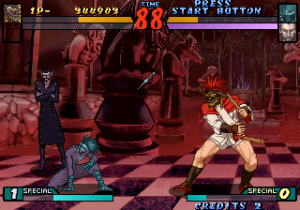 The gameplay was finally improved and feels less jittery and awkward, resulting in a much smoother game. However, during the game’s reimagining, Groove On Fight has lost a lot of what made the earlier Power Instinct games so unique. The darker visuals and edgier feel have replaced most of the wackiness. 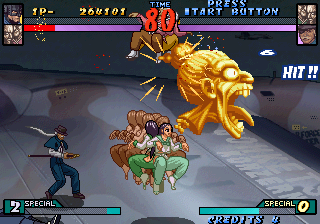 Most of the music is bland and uninteresting, lacking any semblance of the crazy vocals from the second game. 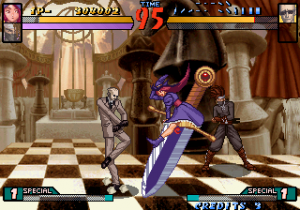 If anything, it seems a little bit closer to the Darkstalkers games. At least it still manages to come up with some weirdly intriguing characters. 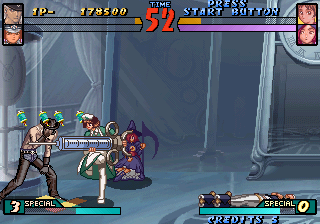 Solus has supplanted the grannies as the “mascot” of this game, which is not necessarily a bad idea. 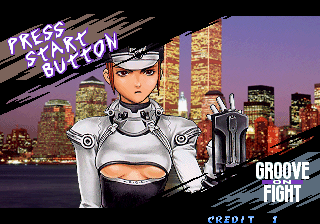 She’s a time traveling cyborg, and apparently robotic police wear bikini bottoms in the future. The brother of Keith. Kind of looks like Kid Rock. Your typical generic-guy fighter, except he has goggles. A giant who wields two huge sticks and wears a scary mask. Groove on Fight‘s variation of Saizo from the other Power Instinct games. 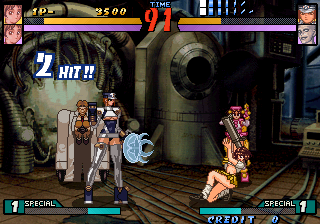 “MAD” stands for “Max Ax Dax”. He appears to be a mad scientist some kind of oversized, robotic suit, which has lots of neat gadgets. Definitely not Sean Connery hiding out in a Japanese fighting game. A badass in a leather mask that wields two huge balls chained together. The two old sisters have returned, although this time they’re tied together back-to-back. Can summons the spirits of the old Power Instinct crew. Somehow replayed to Clara, she’s practically the same character, although Popura has even more crazy cosplay moves. A cute little witch who commands a sentient musical note – which usually just smiles and follows her, but can turn vicious on a moment’s notice. The main bad guy. 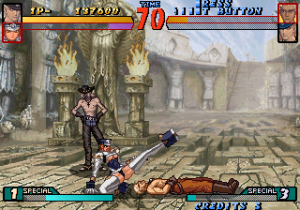 After beating him, you will fight your partner – but before the fight can go anywhere. a demon tears out of his lifeless body and then zombifies your buddy. Gartheimer’s gay lover. 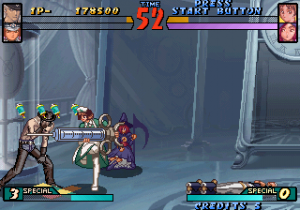 He gets unceremoniously shot in the story mode, but he shows up as a hidden playable character. In addition to the standard four attack buttons, there’s now an “overhead” attack button (usually a very powerful but slow move) and a dash/attack button, which lets you run behind your opponent and give them a quick hit. Once again, the game utilizes a tag system, although this time you can switch between characters mid-battle like the Marvel Vs series. 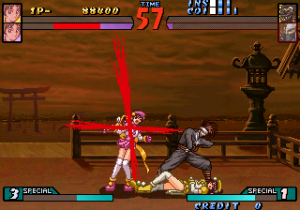 Additionally, defeated foes now stay on the battlefield, and can be picked up and tossed around as a weapon. 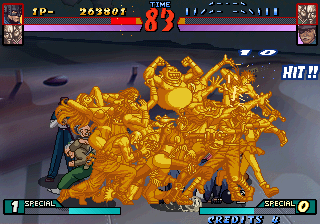 Groove on Fight is undoubtedly a solid game, but there’s not too much here that’s incredibly distinctive, even if the gameplay has improved considerably from the other games. At least the difficulty level is much better balanced. 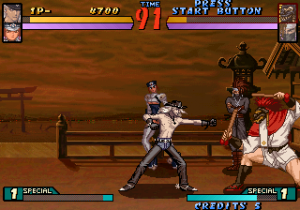 Groove on Fight was also ported to the Saturn – although it requires the 1 MB RAM cartridge, it still has some cut animation and plenty of load times, although the game plays fine otherwise.